The best way to understand the Daughters of Charity organization is to share in the experiences of the Sisters living and working in the developing world. United as Daughters of Charity, they dedicate their lives in service to those who are poor. Stories, videos, biographies and more, will offer a glimpse into the world of the local people and the Sisters, and the struggles and richness of their collaborative work. Esche’s life of fifteen years with her soldier husband and four children was not perfect, but she had shelter in a rented home and food for her children. That meager lifestyle ended five years ago when Esche was 35 years old and her husband died of AIDS. She was left with nothing. With no income and no skills, Esche and her four children lived a very miserable and exploited existence on the streets. She did what she had to and barely lived from day to day. 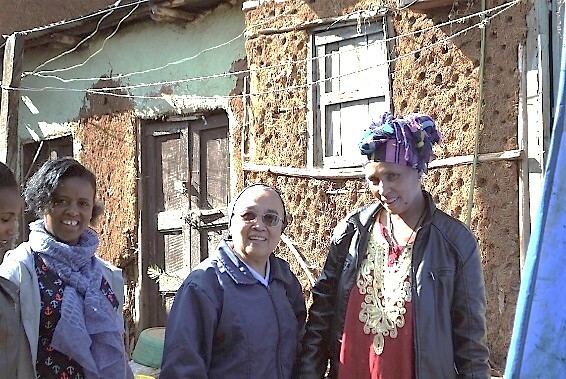 Eventually her own health severely deteriorated and Esche appealed to the government program for Women and Children Affairs and was referred to the Daughters of Charity St. Mary’s Laboratory and Clinic in Addis Ababa, Ethiopia. Along with other women, Esche received support and training about proper hygiene and sanitation, health and dignified living. She describes attending a five-day Business Skills Training course that changed her way of thinking and essentially her life. Armed with new skills, Esche received seed funding to purchase materials and began her own business. She joined a local savings and lending community. Eventually she was able to purchase her own sewing machine and now creates cultural clothing which she sells in the large open “Merkato” market. Now age 40, Esche and her children live a healthy life in their own home, and she is proud that she can pay the educational costs for her children. Her youngest is in kindergarten, two are in primary school, and her eldest daughter is attending Addis Ababa University. “Now I have a dream and I have hope … thanks be to God!” exclaims Esche.